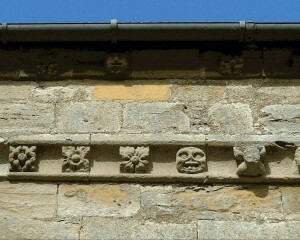 On this other section of cornice we can see the repetition of the grotesque head and floral motifs. A horizontal moulded projection encircling the top of a building, or the component parts of a building, and generally beneath the eaves of the roof. In Classic architecture each of the Orders has its peculiar cornice. In the Perpendicular style, the cornice is often composed of several small mouldings, sometimes divided by one or two considerable hollows, not very deep: in plain buildings, the cornice-moulding of the preceding style are much adhered to; but it is more often ornamented in the hollow with flowers, &c., and sometimes with figures and grotesque animals. In the latter end of this style, something very analogous to an ornamented frieze is perceived, of which the canopies to the niches in various works are examples; and the angels so profusely introduced in the later rich works are a sort of cornice ornaments. 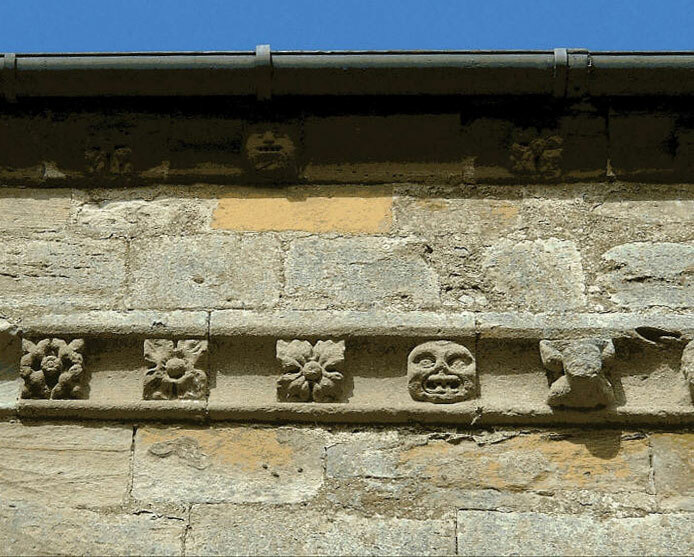 A similar cornice is to be found in the remains of Eynsham Abbey which dates from 1450.